During the cattle drive era cowboys passing Fort Worth along the legendary Chisholm Trail would visit downtown known then as “Hell’s Half Acre” for much-needed recreation at saloons and gambling halls. This is where many of the legends of the Wild West occurred. Robert Leroy Parker, also known as Butch Cassidy, was one of the few outlaws of the Wild West who attained notoriety while still living. Cassidy may have had a relative in Fort Worth, prompting his visits. The folk-hero leader of the Fort Worth Five was known for bank and train robberies. Legend has is that during late 1900 and early 1901 Butch Cassidy and his cohorts, including the Sundance Kid, roamed the streets of Hell’s Half Acre between robberies. Learn more about Butch Cassidy and the Fort Worth Five by adding these historic attractions to your itinerary with our trip builder. 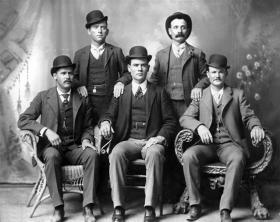 See the famous photo of the Fort Worth Five (also known as the Wild Bunch), taken by Fort Worth&apos;s premier photographer in 1900 at the Heritage Trail Marker located downtown between 5th and 6th Street. Etta Place, known as the mystery woman of the Fort Worth Five, was romantically involved with the Sundance Kid. Spend the night in ‘Butch&apos;s Hideout&apos; or ‘Sundance&apos;s Suite&apos; at Etta&apos;s Place, located in Sundance Square. In Butch Cassidy&apos;s honor, the Stockyards Hotel in the Stockyards National Historic District, features the two-room Butch Cassidy Suite equipped “Wanted-Dead or Alive" posters and authentic photos of Butch Cassidy.